Fig. 19-20(a). 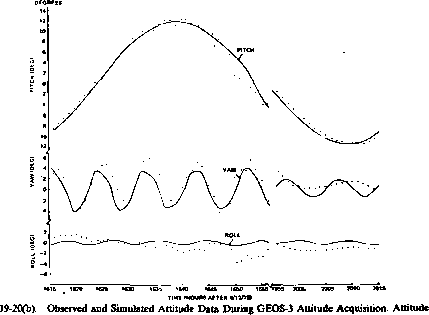 Observed and Simulated Attitude Data During GEOS-3 Attitude Acquisition. Attitude data immediately after boom extension and wheel acceleration. 2. Basset, D. A., Ground Controlled Conversion of Communications Technology Satellite (CTS) From Spinning to Three-Axis Stabilized Mode, Paper No. AÏAA 76-1928, AIAA Guidance and Control Conference, San Diego, CA, Aug. 1976. 3. Blaylock, B. T., and R. Berg, International Ultraviolet Explorer (WE) Attitude Recovery Software Description and Operating Guide, Comp. Sc. Corp., CSC/SD-76/6146, June 1976. 4. Byrne, R„ D. Niebur, S. Hotovy, F. Baginski, W. Nutt, M. Rubinson, G. Lerner, and R. Nankervis, Applications Explorer Missions-A / Heat Capacity Mapping Mission (A EM-A / HCMM) Attitude Analysis and Support Plan. NASA X-581-78-4, GSFC, March 1978.
data 16 hours after wheel acceleration. Roll, which was less than 3 deg before boom extension, has remained small. The yaw libration amplitude has decayed rapidly from near 90 deg to 4 deg. The pitch amplitude remains near the value reached after wheel acceleration. 5. Davenport, P. B., Mathematical Analysis for the Orientation and Control of the OAO Satellite, NASA TN D-1668, GSFC, 1963. 6. Davis, R., and K. Yong, Mission Planning Study for the GEOS-C Spacecraft, Comp. Sc. Corp., 6050-00000-02TR, Jan. 1975. 7. Gambhir, B. L., and D. R. Sood, Spin Axis Attitude Perturbation Due to Spin/Despun Dipoles for the SAS-3 Spacecraft, Comp. Sc. Corp., CSC/TM-76/6010, Jan. 1976. 8. Gebman, J., and D. Mingori, Perturbation Solution for the Flat Spin Recovery of a Dual-Spin Spacecraft, Paper No. AAS 75-044, AAS/AIAA Astrodynam-ics Specialist Conference, Nassau, Bahamas, July 1975. 9. Goldstein, Herbert, Classical Mechanics, Reading, MA: Addison-Wesley Publishing Co., Inc., 1950. 10. Grell, M. G., "Magnetic Attitude Control of the Atmosphere Explorer-E Spacecraft," Proc. Summer Computer Simulation Conf, pp. 320-324, Chicago, IL, Simulation Councils, Inc., July 1977. 11. Hsu, J. C., and A. U. Meyer, Modern Control Principles and Applications. New York: McGraw-Hill, Inc., 1968. 12. IBM Corporation, Radio Astronomy Explorer Attitude Determination Systems (RAEADS), NASA Contract NAS 5-10022, 1968. 13. Jackson, John David, Classical Electrodynamics. New York: John Wiley & Sons, Inc., 1965. 14. Kjosness, D. H., CTS Attitude Acquisition Sequence Detailed Operating Procedures, SED Systems LTD, 5143-TR-101, Jan. 1976. 15. Lerner, Gerald M., and Kathleen P. Coriell. Attitude Capture Procedures for GEOS-C, Paper No. AAS 75-029. AAS/AIAA Astrodynamics Specialist Conference, Nassau, Bahamas, July, 1975. 16. Lerner, G-, K. Yong, J. Keat, B. Blaylock. and J. Legg. Jr.. Evaluation of the Communication Technology Satellite Attitude Acquisition Algorithms and Procedures, Comp. Sc. Corp., CSC/TM-76/6003. Jan. 1976. 17. Markley, F. L., Attitude Control Algorithms for the Solar Maximum Mission, A1AA Paper no. 78-1247, A1AA Guidance and Control Conference. Palo Alto. CA. Aug. 1978. 18. 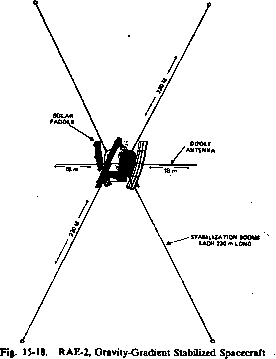 NASA, Investigation of the Dynamic Characteristics of a V-Antenna for the RAE Satellite, NASA CR-962." 1968. 19. Pettus, W., Optimization of Boom Deployment and Momentum Wheel Activation for GEOS-C, Comp. Sc. Corp. Memorandum, May 1973. 20. Phenneger, M. C., M. E. Plett, M. A. Firestone' M. G. Grell. and P. V. Rigterink, Atmospheric Explorer-D and -E Attitude Determination and Control Prelaunch Report Analysis and Operations Plan. Comp. Sc. Corp., CSC/TR-75/6018, Oct. 1975. 21. Repass, G., G. Lerner, K. Coriell, and J. Legg, Jr., Geodynamics Experimental Ocean Satellite-C (GEOS-C) Postlaunch Report, NASA X-580-75-23, GSFC, Feb. 1975. 22. Schmidtbauer, B., Hans Samuelsson. and Arne Carlsson, Satellite Attitude Control and Stabilization Using On-Board Computers, ESRO-CR-IOO. July 1973. 23. Stickler, A., and K. T. Alfriend. An Elementary Magnetic Attitude Control System, AIAA Paper No. 74-923, A1AA Mechanics and Control of Flight Conference, Anaheim, CA, Aug. 1974. 24. TRW Systems Group, HEAO-B Attitude Determination and Control Subsystem Preliminary Design Review, Feb. 1976. 25. Werking, R. D., and R. D. Woolley, "Computer Simulation for Time Optimal or Energy Optimal Attitude Control of Spin-Stabilized Spacecraft," Summer Computer Simulation Conference, Montreal, Canada, July 17-19, 1973, Proceedings, Vol. 1, p. 448-453, Society for Computer Simulation Inc., La Jolla, CA, 1973. 26. Werking, R. D., R. Berg, K. Brokke, T. Hattox, G. Lerner, D. Stewart, and R. Williams, Radio Astronomy Explorer-B Postlaunch Attitude Operations Analysis, NASA X-581-74-227, GSFC, July 1974. 27. Williams, Robert S., An Analysis of the RAE-B Attitude Control System, Comp. Sc. Corp. 5023-06300-07TR, March 1971.